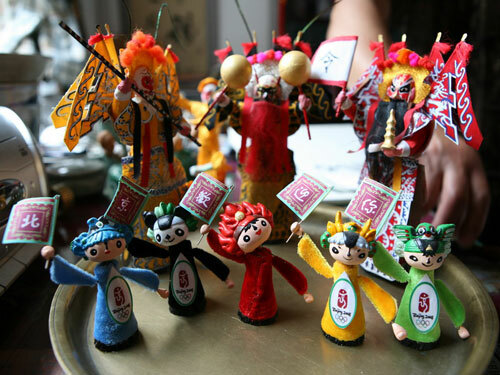 Zongren is a unique form of folk handicrafts in Beijing with a history of over 100 years. It emerged during the very end of the Qing Dynasty under the influence of Chinese shadow play and Beijing opera. In 1915, it won the silver medal at the Panama-Pacific International Exposition and attained overnight global recognition. The doll's head and base are made of plaster, with its body made of straw. It's dressed in colored paper or silk and lined with cotton wadding. Different types of facial makeup and dresses are created according to the specific characters and stories. On its base there sticks a circle of pig hair as long as two or three centimeters. Many dolls together can form a set of dramatic characters standing on a copper plate, tapping and dancing away as the result of the bounce of bristle.